Usually I start baking for the holidays around the week of Thanksgiving. Since this year I will be relaxing island-style away from a kitchen, I've started a little early. The freezer makes all things possible. My mom gave me the Mrs. Fields Best Ever Cookie Book when I moved into my first real apartment in 2002. I think I've made this recipe each year since. Preheat oven to 300. 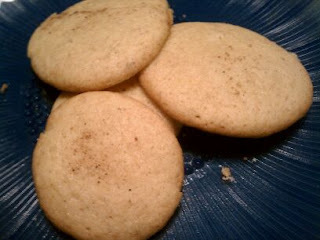 In a medium bowl, combine flour, baking powder, cinnamon and 1/2 t nutmeg. Mix well and set aside. In a large bowl, cream sugar and butter with mixer until grainy. Add eggnog, vanilla and egg yolks and beat at medium speed until smooth. Add flour mixture and beat at low speed until combined. Drop by rounded teaspoons onto ungreased cookie sheet. Sprinkle lightly with nutmeg. Bake for 20 minutes (Colorado time...the recipe says 23-25). Transfer to cool surface immediately with spatula (and they aren't kidding...you let them sit on the cookie sheet and you may never get them off).